Edited by Pauline Books & Media. 12 1/2 x 13 in. 52 pgs. 24 beautiful full-page full-color icons with adjoining page with description. 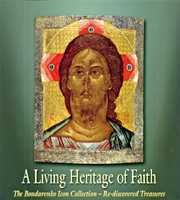 A Living Heritage of Faith is a unique publication, as it gives an unparalleled overview of many previously unpublished icons. It is a presentation of a relatively recently established collection that was exhibited for the first time in Moscow in 2003.